Feathers are at their most beautiful on the bird. This is how it should be and how the birds mean to show off their feathers. 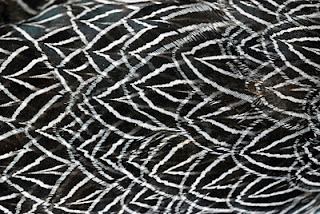 On the body, each feather overlaps and shows only the tip in a repeating pattern—usually a variation of a diamond pattern. The color and pattern and sometimes structure in each individual feather is geared toward the part that is exposed, what you see on the bird. This close-fitting, repeating pattern with no spaces in between is part of what keeps the penguin and duck dry. It’s what makes the snipe and the grouse blend with its surroundings and hard to see. The tight repeating feather patterns keep birds smooth and aerodynamic. Some male’s brightly colored repetitions of feathers in certain places attract the females—like a peacock tail. My feather-art uses single feathers, divorced from the birds but I still like to bring out the theme of repeating patterns that is so important in feathers.